About "ESV Macarthur Study Bible Large Print (Black Letter Edition)"
The ESV MacArthur Study Bible, Large Print includes the full ESV text and all of the same study content as the original ESV MacArthur Study Bible edition, but in a larger typesetting. Based on 40 years of Dr. MacArthur's careful study, this Bible provides a note, insight, or explanation for nearly every verse-now in an even more readable format. 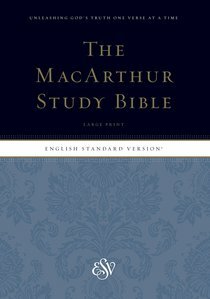 Articles on "How We Got the Bible" and "Introduction to the Bible"
Customer Reviews For "ESV Macarthur Study Bible Large Print (Black Letter Edition)"